Based on a reader survey, the magazine says Los Angeles 29th out of 35 major cities on a vote by residents while visitors scored L.A. as No. 32. Not to sound too much like a spinmeister, but I’m guessing transit in Los Angeles scored better than local sidewalk scene, which is very lacking in many parts of town. It probably didn’t help that there is no rail connections yet to Santa Monica or Disneyland, two parts of the Southland that attract a lot of tourists. Supervisor Zev Yaroslavsky spoke to the Beverly Hills Rotary Club earlier this week and didn’t mince words — in other words, he was refreshingly himself, as usual — about the dispute with Metro over the route of the Purple Line Extension. Yaroslavsky, in particular, took aim at the Beverly Hills Unified School Board’s decision to keep spending money on lawsuits against Metro while it considers asking voters next spring to approve a parcel tax to help erase a budget deficit. Yaroslavsky’s main point is that even if the lawsuits succeed, a victory would only ensure that Metro has to re-do parts of its environmental studies on the subway project. A court victory does not mean that Metro has to change the subway’s route and it remains unlikely the Metro Board would choose to do that given there is no credible scientific evidence that it’s safe to build a station under Santa Monica Boulevard, nor is there any evidence that it’s unsafe to tunnel under any parts of the Beverly Hills High School campus. Yaroslavsky also criticized the Courier for attacking Beverly Hills Mayor Willie Brien for attending the groundbreaking event for the beginning of utility relocation of the subway’s first segment, which ends at La Cienega Boulevard, far from Century City. The Courier has used its news and editorial pages — the two are often indistinguishable — to fight the subway route and support/promote local politicians who agree with the newspaper. 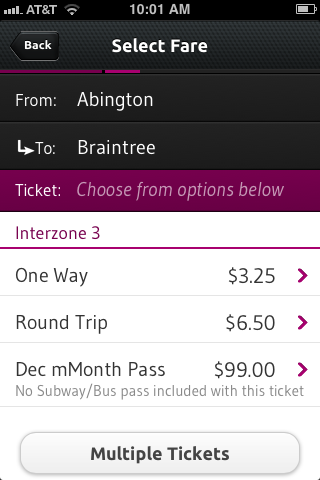 A new app allows commuter train riders to buy a ticket on their smartphone. Conductors on the train are trained to check tickets on a phone, saving the local transit agency the hassle of printing and dealing with paper tickets. The app is nicely designed and easy to use. For example, in the original Seattle Transit Plan that I worked on in 2005, we asked not “what interventions can we make to speed up those buses a bit?” but rather “how fast (and frequent) do the buses have to be to deliver the scale of mode shift that is essential to what Seattle wants to be as a city?” San Francisco’s Transit Effectiveness Project is a similar model. Get influential policy people thinking about the second question, and the battlefield changes, because now each struggle to remove a parking space is part of a citywide or regionwide sustainability mission. Boy, I’d love to hear local transit planners be more explicit about this and say something like “If we’re trying to get Jane Smith our of her car, which she can take directly from her driveway to a free parking spot near her desk, we probably need to build something that travels at X speed and runs X frequently and that will come at a great expense: X amount of dollars.